My previous articles have focused on using native plants and natural groundcover so that birds, pollinators, and other wildlife can thrive. In this article, I’ll go into more depth about the problems posed by alien plants, identify some of the worst of them, and suggest some approaches to keep the aliens from taking over. I’ll build on the experience that our Bird Friendly Habitat Certification team has gained in doing 72 yard visits to date, covering more than 300 acres. I’ll also rely heavily on the writings of Doug Tallamy in books such as Bringing Nature Back Home and The Living Landscape (coauthored with Rick Darke). If you haven’t read these books, I highly recommend them! 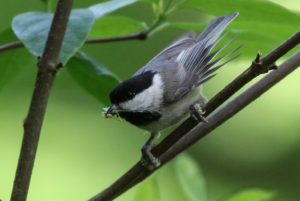 Carolina Chickadee with insect for nestlings. So why not import attractive plants from Europe, Asia, and other foreign sources to our yards and gardens. We’ve been doing this from the beginning of the European settlement of North America, and most people see this as harmless. And often these plants are disease resistant and pest free. What could be wrong with this picture? Tallamy cites three issues associated with the importation and use of alien plants including: loss of food sources, introduction of pests and diseases, and escape of aliens from our properties that then become invasive and displace native plants in the wild. Let’s look at each of these issues in turn. Let’s start with the loss of food sources. The interdependent web of existence starts with plants, which convert sunlight to energy. This energy is passed up the food chain and supports all higher life forms. A vital link in the food chain for many species of animals is herbivorous insects. These insects eat the plants and then are eaten by animals such as birds. Those insects co-evolved with the plants native to each area, and alien plants simply don’t support the numbers and types of insects that birds must have to thrive, especially during the critical period of raising their young when the nestlings need insect food to survive. 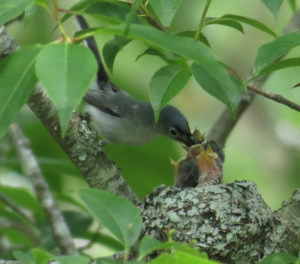 Blue-gray Gnatcatcher feeding insect to nestlings. A second strike against alien plants is the possibility of the introduction of very destructive diseases and insects. In Tallamy’s words, “alien plants can be Typhoid Marys”. One of the most famous examples is the destruction of the American chestnut tree by the importation of chestnut blight on Japanese chestnut trees. The American chestnut at one time was the predominant species in eastern forests. This tree provided such a wealth of food for wildlife that it is likely that eastern forests have never regained the numbers and diversity of wildlife they once had. But the chestnut blight is ancient history to most of us, having occurred at the turn of the 20th Century. Laws have been passed since to try to prevent such disasters, so is this still a problem? The answer is yes. There is a long list of diseases and insects that continue to be imported since it is impossible to screen out everything on imported plants. More recent examples of diseases that have escaped detection and now pose severe threats to native plants include dogwood anthracnose and sudden oak death disease. On the insect side we’ve imported destructive insects like Japanese beetle, Hemlock and Balsam wooly adelgids (threatening eastern hemlock trees and fir trees), Emerald ash borer (threatening destruction of all our native ash trees), and Viburnum leaf beetle. 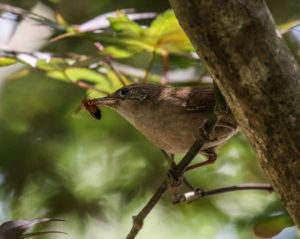 House Wren with insect for nestlings. Last but certainly not least, some alien plants escape cultivation and become “invasive species” since they displace native plants in the wild. And it can be difficult to predict which ones might escape and become invasive since they can be well-behaved for decades before becoming threats to wild areas. Birds can even be the culprits in spreading these invasives by eating their berries, a subject Johnny Randall covered in depth in his blog article, “Invasive Plants Are NOT for the Birds”. Recognize some of these names? Do you have some in your yard? Even after removing many, I still have three species of alien invaders in my yard that I planted years ago and also continue to battle a number of other invasive species as they try to establish a foothold! but I’m removing the berries now!. 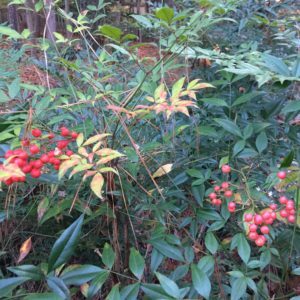 Then start removing invasive aliens by prioritizing the ones with the highest threat levels, using the NC Native Plant Society’s threat level ranking. As to how to go about removing these alien invaders, the North Carolina Botanical Garden has created a handy brochure with just the information you need. 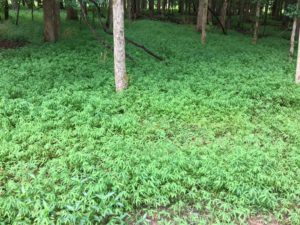 Japanese Stiltgrass taking over a wooded area. Finally I would point out that winter is an excellent time to remove invasive species as Barbara Driscoll has pointed out in her blog article, “Now is the Time to Remove Invasive Plants”. As she notes, many invasives are evergreen and will stand out as some of the few green plants on your property in winter. But hurry to identify them now since spring is on the way, and if this warm weather persists, it will be early this year.